Here AT HOME, we are more than just florists. We also do consultations for interiors and home decorating. I just presented this set up to a client who is looking for a guest room option. They need furniture for their second home at the lake. 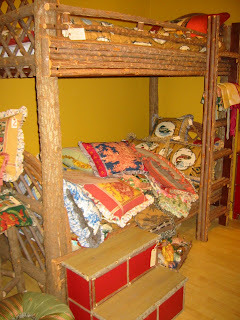 They have young grandchildren, and I love this rustic set of bunks! When I saw it, I thought “PERFECT”! It even comes in full and queen sizes! YUM! What a great way to sleep the weekend away at grandma and grandpa’s lake house! The memories they will make, the dreams they will have in these bunks. For the bedding, it is paisley and plaid with terrific upholstery trim.